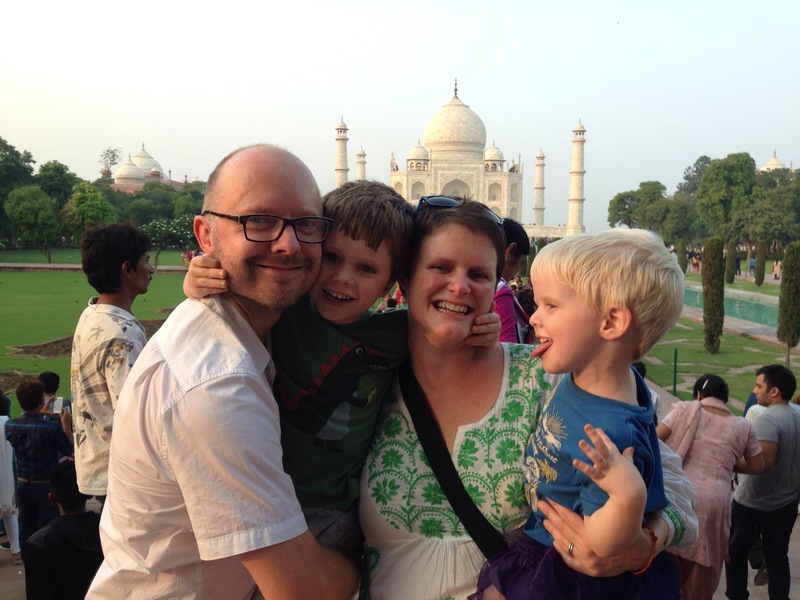 A few days before we left Delhi we had an overnight jaunt to see the Taj Mahal in Agra. We opted for a car, driver and hotel package. A good trial run for the company taking us round Rajasthan. Images of Indian life with which we are all familiar unfurled as we watched from the car window; familes of 4 or or 5 on a single motorbike, the babies wedged between adults for safe keeping, brightly coloured lorries blaring their horn; and traffic halting to let cows cross the road. 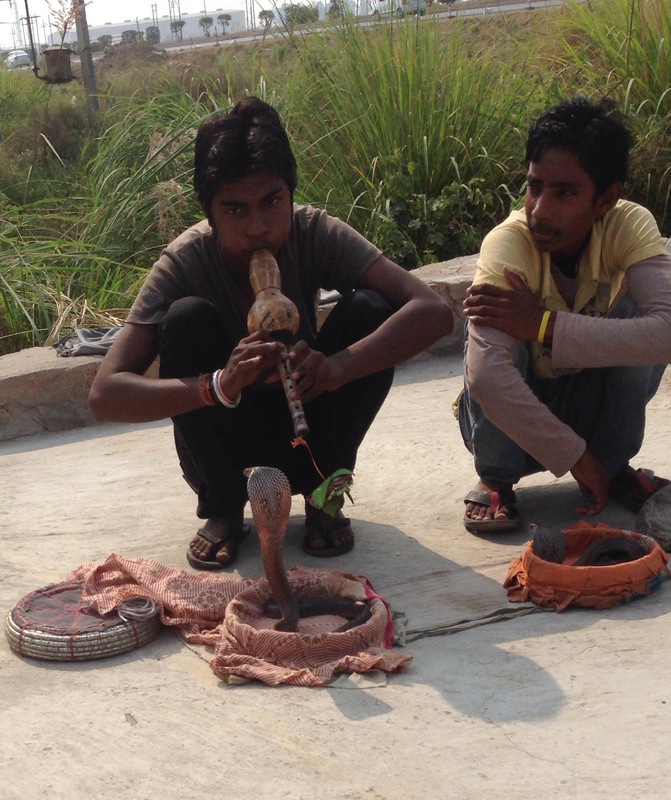 We stopped at a touristy services and much to G’s delight encountered his first snake charmers and their Cobras. There were also a number of monkeys in chains, dressed as people and made to dance. This made me extremely uncomfortable so the less said about that the better. We arrived into Agra and our hotel The Taj Villa (after a minor detour to The Taj Villas round the corner) with a couple of hours to spare before we were to the visit the Taj Mahal for sunset. After five hours cooped up in the car we were all eager to stretch our legs. We wandered down a little side street to explore. There were many children around all wanting to meet the boys. 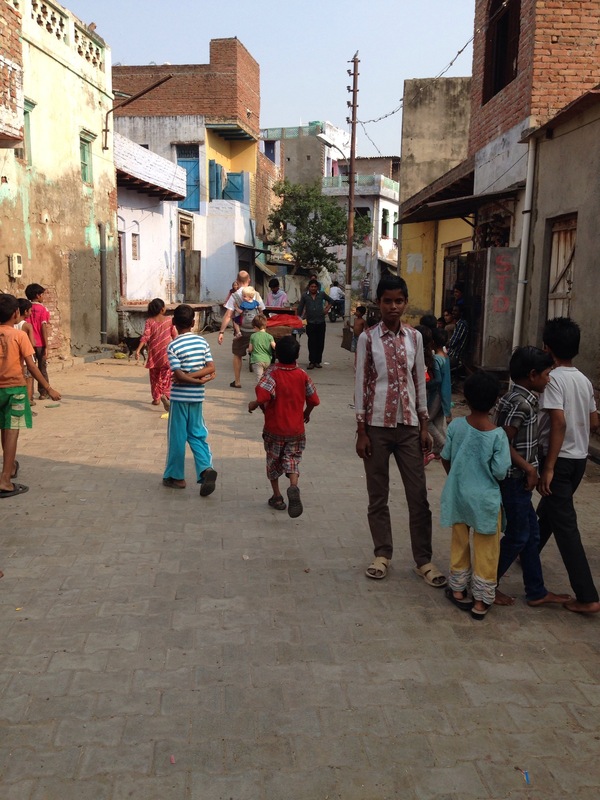 We felt like the Pied Piper leading a merry procession down the backstreets of Agra. We grabbed a wonderful samosa from a street vendor to keep us going until dinner and headed back to the hotel to meet our driver Pal and our guide for the day. Stopping briefly so Nick could help two guys push start their car. Much to their amusement. Walking towards the entrance I was amazed by how many people there were. Many foreign tourists and hundreds, maybe thousands of Indians. Half of whom sought photo opportunities with the kids. Heaps of hawkers waving souvenirs in our faces. They were Auto drivers, camel carts and horse & trap rides. All hustling for our business. This was the kind of mele I had expected in Delhi. We declined a ride and walked the short distance to the entrance. We got our tickets (I was glad of the separate window for foreigners as the main ticket window queue was epic) and queued to pass through security. Nick and the boys passing down the High Value Ticket Holders line whilst I was ushered into the line for women. As we passed into the outer courtyard our guide Shespal told us lots of information which mainly went over my head as I chaperoned the boys whilst many families wanted to take their photos. Picking Tomas up and pinching his cheeks, much to his bemusement. The Taj Mahal is such an iconic building I was worried that I’d be underwhelmed and yet it was utterly breath-taking to see it in person. It is easy to see why it is considered the most beautiful building in the world. We paused to take our own photo opportunity in front of the ‘Crown of Palaces’. The boys good humour at getting as much attention as the Taj itself eventually wained. They were tired, hungry and grumpy. And nerves were beginning to fray. We joined the hordes to go inside the central dome of the marble mausoleum. If I’d have known what it was going to be like in there I wouldn’t have bothered. Whilst I pride myself on looking on the brightside this just felt like an ordeal. There were so many people. It was hot, dark and noisy (the security guards constantly blowing whistles as they herded us through). We were corralled as they let people in and out in blocks. It felt like being kettled. I was carrying Tomas in my arms and the crush of bodies had him scared. As we were released and carried along in the throng there were raised doorsteps adding a bonus hazard. No place for children, nevermind the newborn infant that was getting squashed next to Nick. Serves us right for going on a Sunday during the Diwali holiday period. We were very happy to escape into the comfort of our air conditioned car and be whisked away to a restaurant that had beer. Boy had we earned it. Our room at Taj Villa was clean and comfortable (bar the serious need of curtains) but was in part still a building site with wires sticking out all over the place. Not ideal, particularly with the children, but excellent leverage for knocking down the price on our Rajasthan tour! In the morning we visited Agra Fort on the opposite side of the river Yamuna. We missed getting there for sunrise, opting instead to let the children sleep. We enjoyed a wander round the fort in relative peace and the boys were delighted to spot some wildlife. Monkeys, Parrakeets and the friendly squirrels which ate out of their hands. Emperor Shah Jahan, the builder of the Taj Mahal, was imprisoned by his son at Agra Fort. From here he could gaze across the water to his wife’s tomb. A monument so beautiful that he said it made ‘the sun and the moon shed tears from their eyes’* and I’d have to agree with him. Thanks lovely. We miss you! How lovely to read from you ..and have the opportunity to follow your adventure! I am very proud of you all! The Taj – So Magical – even after every documentary, photo, travellers account, etc – there is nothing quite like being there. Our experience was very different from yours, everyones is, but still it is a must see.